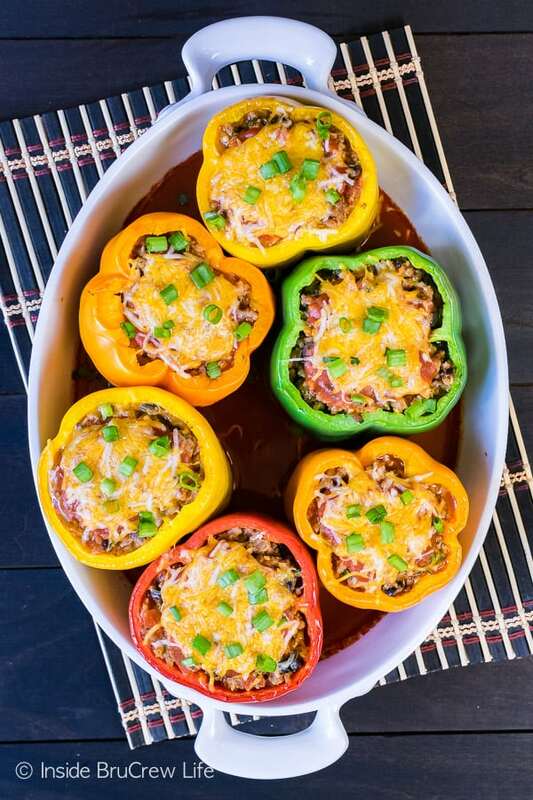 Make a pan of these Healthy Stuffed Peppers this fall to feed your hungry family. 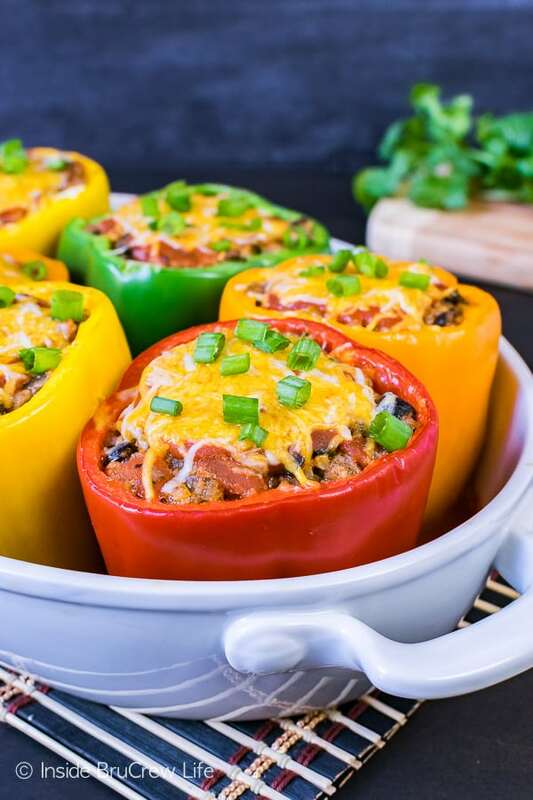 Each pepper is loaded with lots of meat and veggies and is the perfect nutritious dinner. 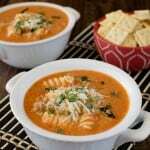 *I am partnering with Red Gold® as a brand ambassador this fall creating recipes using canned tomatoes. As always, all opinions are 100% my own. The first thing out of each of our kid’s mouth when they walk in the door is “what’s for dinner?” You would think they hadn’t eaten in weeks with how hungry they act. But I know better because every morning either my hubby or I get up and make sure they have a lunch to grab as they walk out the door. Yes, our kids are teenagers and are totally capable of making their own lunches and some days they do. But I love sending them to school with a lunch that was hand packed with love. Hmmmm, I wonder what they would think if I started adding little notes and messages like I used to when they were little. They might start making their own lunches and I would get a few extra minutes of snoozing. Just kidding. I would totally do it again if they told me how embarrassed they were because that’s our j0b as a parent, right? Embarrass them with lots of love! They don’t even wait for us to answer with our dinner plans because they are already pulling open every cupboard and the fridge to see what they can devour. I get it. Our daughter starts school at 7 and eats lunch at 10 am, so she is hungry when she walks through that door at 3. She is cursed with her mama’s sweet tooth and would eat bites of this cookie dough cheesecake brownie pie all day long if we didn’t watch her.We are trying very hard to teach and model healthy eating habits, so we have to keep an eye on her. She usually tries to sneak chips and cookies to her room to munch on. 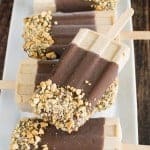 There are always fruits and veggies in the fridge that we offer them for an after school snack, but that usually gets met with lots of grumbles and complaining. If they are hungry, they will eat it, right? Our kids are fortunate to live in a household that always has food in the fridge and in the pantry. They honestly do not know what it means to be truly hungry. They may not like the food choices and snacks that we offer them, but at least they have food on their plates and stomachs regularly. There are so many homes and families across our great nation that are struggling. Did you know that 1 in 8 families do not know where their next meal is going to come from? That number blows me away. It also makes me a little embarrassed because I know how much excess food we buy and waste weekly. This fall I am partnering with Red Gold® to share easy recipes that you can make for your families using their canned tomatoes. They are partnering with Feeding America to launch the 2nd annual Crush Hunger campaign. This month for every can of Red Gold tomatoes that you purchase, Red Gold will donate a meal to a family in need. By simply placing a few cans of tomatoes in your shopping cart, you are helping to put a few meals on someone’s table. How easy and cool is that?!?!?! Let’s help them reach their goal of 2 million meals! Most days we try to plan a healthy lean and green meal for our dinners. 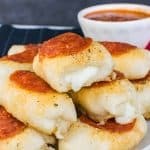 Usually these meals are a hit or miss with our kids. 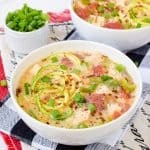 They still prefer this ooey gooey meat lover’s pizza ravioli over things like these parmesan garlic shrimp zucchini noodles. Let’s be honest…so do I. I have to make the choice each day to love (and eat) veggies. As I pulled out cans of tomatoes from the pantry, I got the urge to make stuffed peppers for dinner. And when the urge to use veggies hits, I have to jump on it right away because that doesn’t happen often. Since we are trying to limit our carbs, I used riced cauliflower in place of the actual rice. You guys! 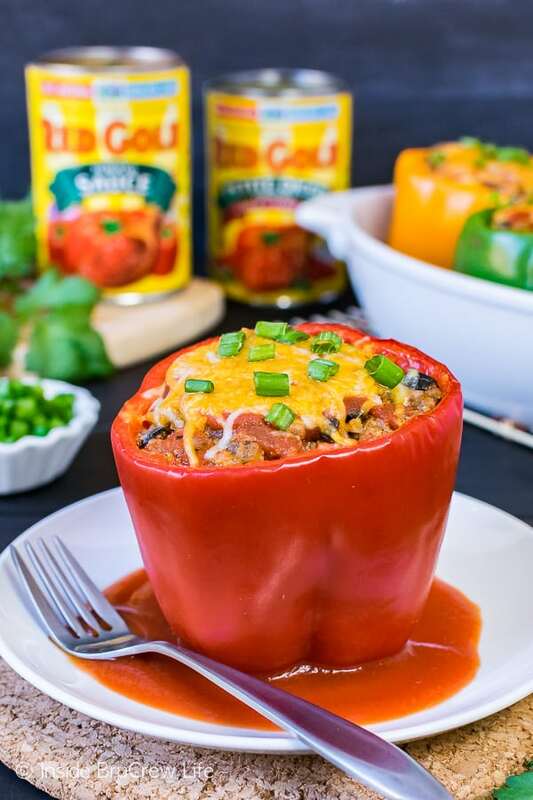 Our kids couldn’t even tell the difference in these healthy stuffed peppers. In fact, our youngest, pickiest eater devoured 2 1/2 of these peppers right away. And he has asked for them to be on our menu again. I’d say that’s a winner, winner healthy dinner right there. 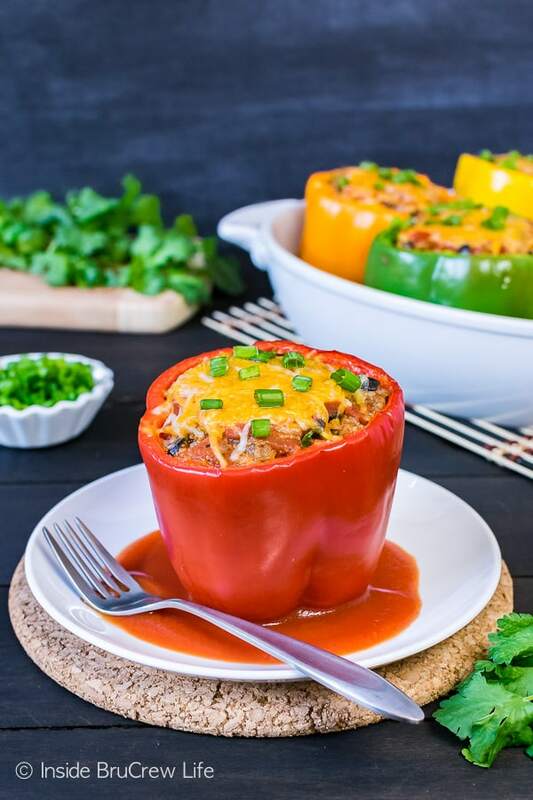 These easy Healthy Stuffed Peppers are loaded with meat and veggies. Perfect nutritious dinner to feed your hungry family for dinner. Preheat the oven to 350 degrees. Spoon half the can of tomato sauce into a bowl. Mix in 1/4 cup water. Spread this mixture on the bottom of a greased casserole dish. Set aside. Cook the ground beef and garlic in a skillet until cooked. Remove any grease, if needed. 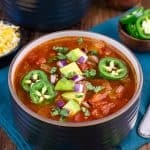 Mix together the cooked beef, cauliflower rice, diced tomatoes, olives, green chilies, spices, lime juice, and cilantro in a bowl. Season to taste with salt and pepper. Spoon the mixture evenly into the 6 bell peppers. Stand the peppers up in the prepared pan. Cover the entire dish with foil and cook for 40 minutes. 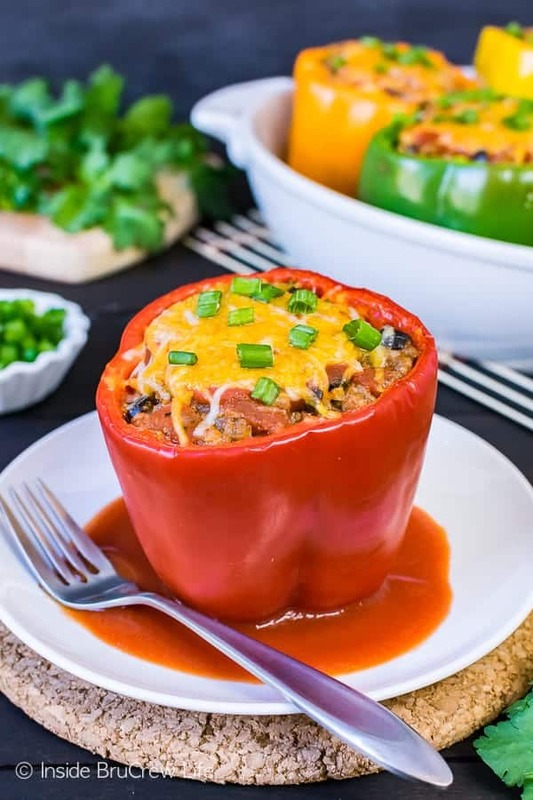 Remove the foil and spoon a tablespoon of leftover tomato sauce on top of each pepper. 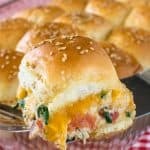 Top with cheese and place back in the oven for 10 minutes. Serve immediately with green onions. Giiirl these are so pretty, you had me at lean and green! !